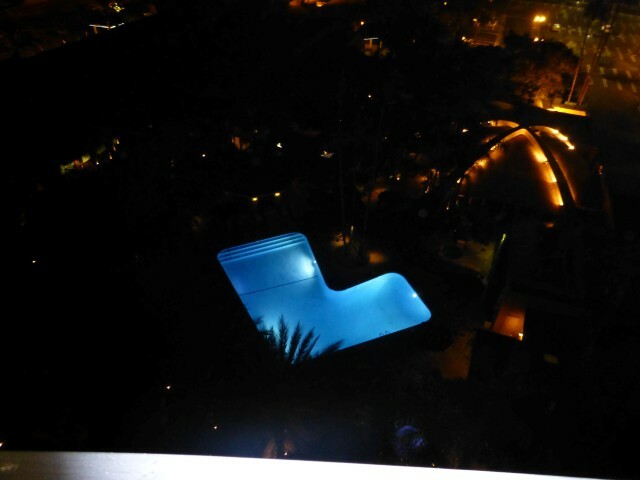 As part of my Starwood (@SPG) Hotel Hopping in SoCal, I chose the Sheraton Park Hotel at the Anaheim Resort. We arrived at nearly mid-night on Sunday and I was planning on heading out the next morning at 07h00. Check-in was smooth and uneventful. 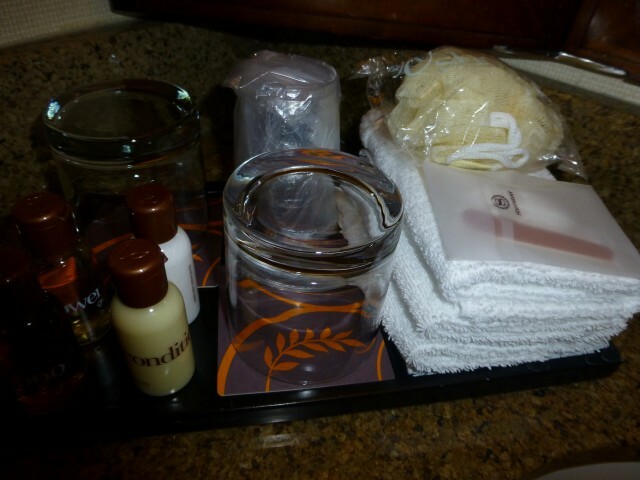 The amenities of the resort were not outlined but I figured that is because of my late check-in and my single night stay. The guest rooms are in a different tower than the check-in area – and you had to walk outside between the two buildings. This isn’t a big deal considering the weather in Orange County leads itself enjoying the outdoors more than other locales. 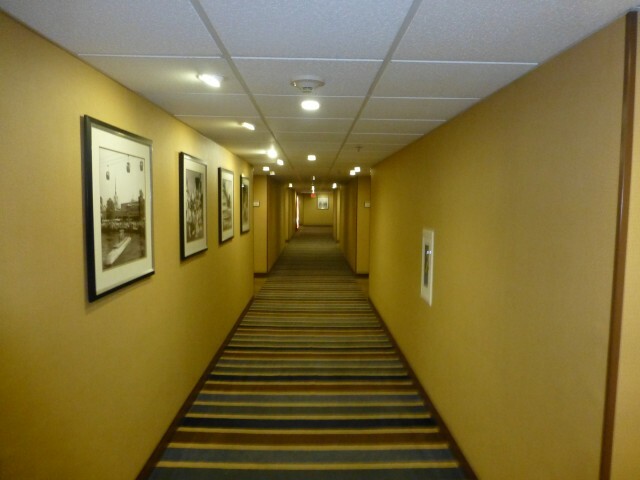 The hallways in the guest tower were bland but looked quite nice, considering this is a family hotel right next to Disney. 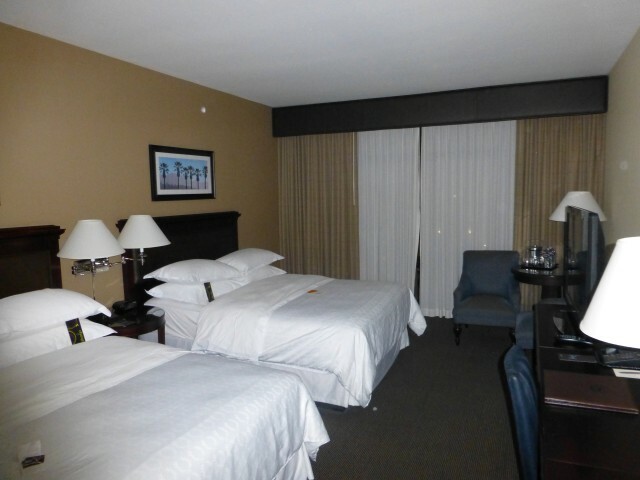 I had asked for a king room, but was given a room with two queen beds. Since I would be in the hotel for a grand total of 7 hours, I wasn’t going to complain. 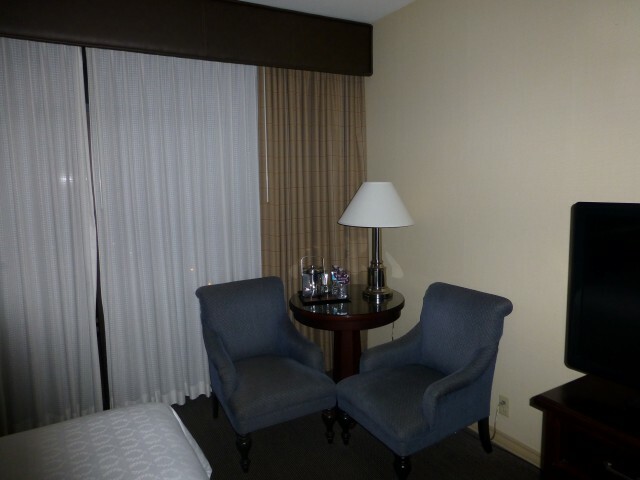 The two beds had bright white linens (which were clean…unlike the Westin Alexandria). There was an outlet on the wall next to the bed, so I could plug in my gear, which is a huge plus. 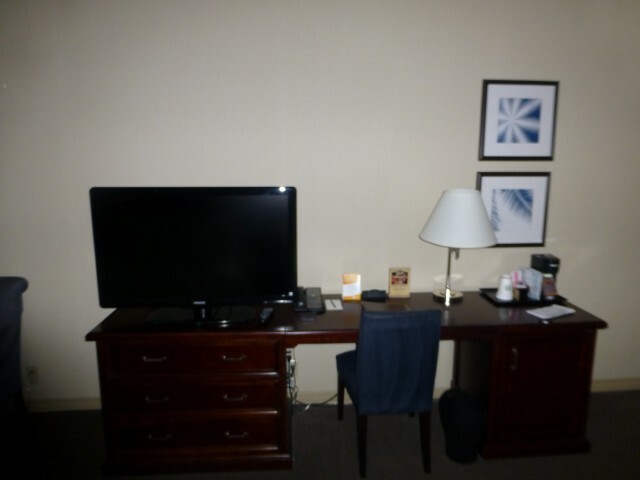 The room had a small flat panel TV on the classic desk. The space really wasn’t all that conducive to working (too tight of a space with the TV on the desk), but since I was only in the room to sleep, it would suffice. 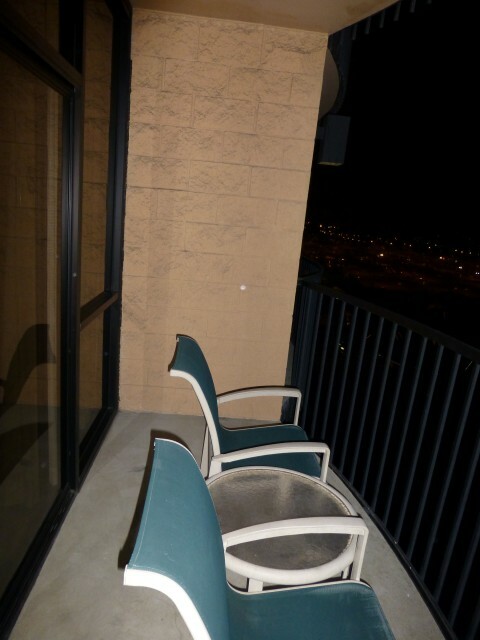 I also had two club chairs in the corner, flanking a small occasional table. I didn’t use this area at all at this hotel, but I did at both the other hotels on this Starwood Triad Trip. 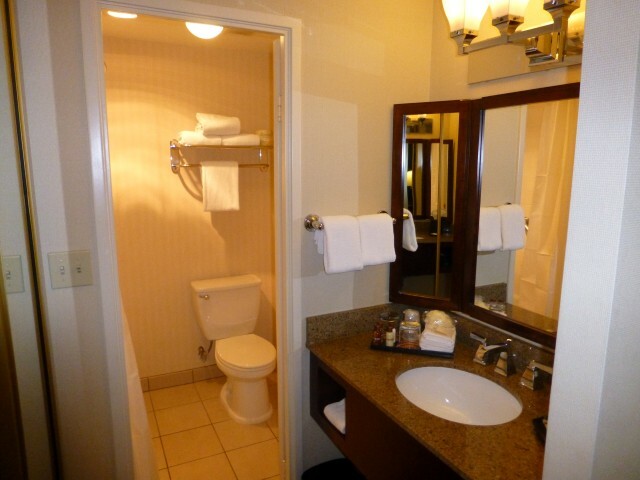 The bathroom was a standard hotel bathroom with the toilet and shower in a room separate from the sink, which allows two people to get ready in the morning without stepping all over each other. While the water pressure and temperature were excellent, the shower itself was absolutely miserable. Check out that shower head — even at that angle it just shot me in the lower chest. I really had to duck to wash my hair. Then the tub wouldn’t drain, so within just a couple of minutes, I was standing ankle deep in soapy water. So gross. 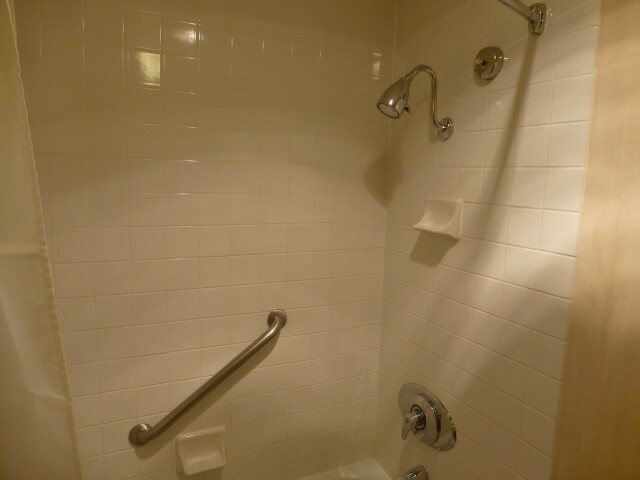 I did love the upgraded hard product amenities at this hotel. The small body wash puff was lovely. I use a scrub puff thing at home and hate that I don’t have one for the road (too messy to travel with). This is an amenity that all hotels should provide. It really makes the shower so much more effective. The room also had a small balcony with a couple of chairs looking out on the other buildings in this complex and the pool. The view wasn’t all that spectacular, but it was nice to have a private outdoor space — I was only out there long enough to take photos then I hit the hay. 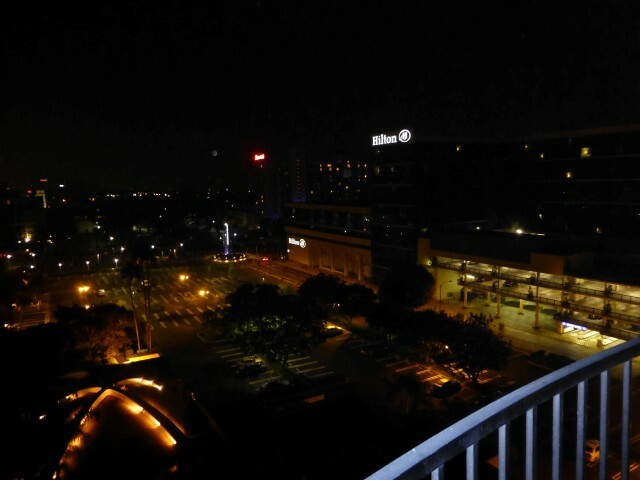 This was my first time staying at this hotel and my third time staying at various hotels in this greater Disney/Anaheim area. For the price and the location (because of work, not Disney) this property worked out quite well. Since my stay was so short, I cannot comment on any of the other amenities (pool, breakfast, workout room, internet speed, etc).